Kenora Airport Authority is actively seeking companies to develop vacant land at our premium facility. As a primary economic generator in the region, with a large base of aviation, emergency usage (Ornge & MNRF) and charter services, the airport is well positioned for further growth. The airport is conveniently located in the East-North-East quadrant of Kenora, providing your business with ready access to the Trans Canada highway, downtown Kenora, CP Rail link and air transportation. We offer competitive lease rates and are looking to establish long term relationships with companies who wish to locate or expand their business at YQK. The region itself is known as a growing tourist destination and an innovator in preserving the fresh water lakes in and around Lake of the Woods with the prime example of IISD-ELA (International Institute for Sustainable Development Experimental Lakes Area which is the world’s freshwater laboratory). Other large industries include healthcare, forestry and government. Proximity to Winnipeg, Manitoba and being the furthest most western city in Ontario, make Kenora an obvious hub for business development and economic investment, while still offering the quality of life that a larger city can provide. Many residents commute by vehicle or bicycle, and enjoy Canada's year-round outdoor pursuits. These factors, along with a beautiful natural setting, make Kenora an ideal place for employers looking to recruit new talent especially with Kenora targeting the younger generations to live here. The airport itself is located approximately 9KM East-North-East of Kenora with a direct highway route providing ready access to the urban core and beyond. With fantastic local amenities, close proximity to suppliers and transportation, the airport could be an ideal location to move your business to the next step. The airport has approximately 96.3 acres of groundside land available to develop, with a significant section in the northwest quadrant. The groundside lands have great access to the Kenora by-pass for trucking activity as well as easy access to the city of Kenora. With such a vast amount of space ready to be used, it could be perfect for any industry including the building of a casino. 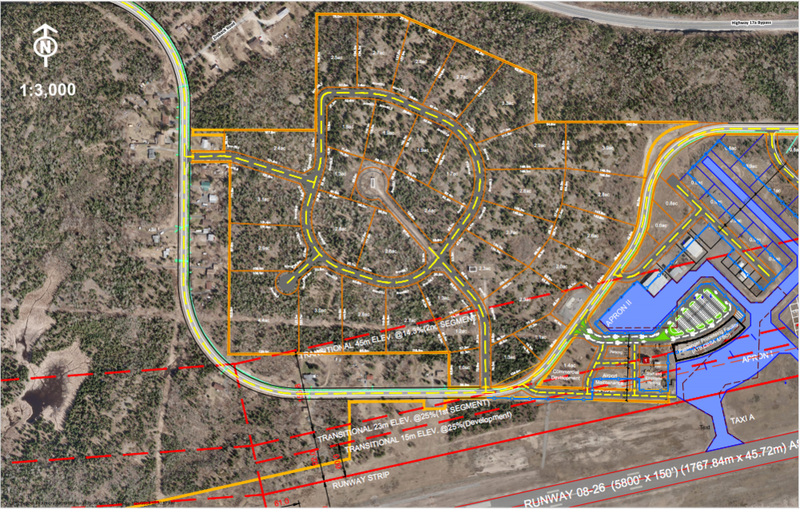 Below is a picture of our land use plan. As explained above, for more information please contact us.